Middlesex County is a county located in north- central New Jersey, United States. In 2017 the Census Bureau estimated the county's population at 842,798, making it the state's second-most populous county, an increase of 4.1% from 809,858 in the 2010 census. Middlesex is part of the New York metropolitan area, and its county seat is New Brunswick. The center of population of the state of New Jersey is located in Middlesex County, in East Brunswick Township, just east of the New Jersey Turnpike. The 2000 Census showed that the county ranked 63rd in the United States among the highest-income counties by median household. The Bureau of Economic Analysis ranked the county as having the 143rd-highest per capita income of all 3,113 counties in the United States (and the 10th-highest in New Jersey) as of 2009. 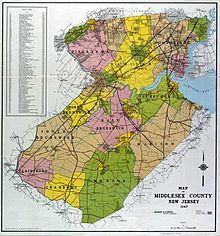 Middlesex County holds the nickname, "The Greatest County in the Land". 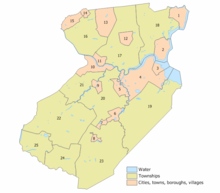 The county was primarily settled due to its ideal location near the Raritan River and was established as of March 7, 1683, as part of the Province of East Jersey and was partitioned as of October 31, 1693, into the townships of Piscataway, Perth Amboy and Woodbridge. Somerset County was established on May 14, 1688, from portions of Middlesex County. The county's first court met in June 1683 in Piscataway, and held session at alternating sites over the next century in Perth Amboy, Piscataway and Woodbridge before relocating permanently to New Brunswick in 1778. Middlesex County hosts an extensive park system totaling more than 6,300 acres (2,500 ha). According to the 2010 Census, the county had a total area of 322.83 square miles (836.1 km2), including 308.91 square miles (800.1 km2) of land (95.7%) and 13.91 square miles (36.0 km2) of water (4.3%). The county is named after the historic English county of Middlesex. Bisected by the Raritan River, the county is topographically typical of Central Jersey in that it is largely flat. The elevation ranges from sea level to 300 feet (91 m) above sea level on a hill scaled by Major Road/ Sand Hill Road near Route 1 in South Brunswick Township. As of the 2010 United States Census, there were 809,858 people, 281,186 households, and 203,016.292 families residing in the county. The population density was 2,621.6 per square mile (1,012.2/km2). There were 294,800 housing units at an average density of 954.3 per square mile (368.5/km2). The racial makeup of the county was 58.60% (474,589) White, 9.69% (78,462) Black or African American, 0.34% (2,777) Native American, 21.40% (173,293) Asian, 0.03% (251) Pacific Islander, 6.99% (56,569) from other races, and 2.95% (23,917) from two or more races. Hispanic or Latino of any race were 18.40% (148,975) of the population. There were 281,186 households out of which 34.4% had children under the age of 18 living with them, 55.9% were married couples living together, 11.8% had a female householder with no husband present, and 27.8% were non-families. 22.5% of all households were made up of individuals, and 8.9% had someone living alone who was 65 years of age or older. The average household size was 2.8 and the average family size was 3.29. In the county, the population was spread out with 22.9% under the age of 18, 10.2% from 18 to 24, 28.3% from 25 to 44, 26.3% from 45 to 64, and 12.3% who were 65 years of age or older. The median age was 37.2 years. For every 100 females there were 96.4 males. For every 100 females ages 18 and older there were 94 males. As of the 2010 Census, there were 170,070 people of Asian descent in Middlesex County accounting for 21% of the county's total population. At 61.57% of the population of Asian descent, Indian Americans accounted for a majority of the county's Asian population or 12.93% (104,705 people) of the county's total population in 2010, increasing to 119,579 (14.4%) by 2015, more than that of the other sub-groups combined. Middlesex County had the largest population of Asian Indians of all counties in New Jersey; in the 2010 Census, only Santa Clara County, California (117,596) and Queens County, New York (117,550) had a larger population of Asian Indians. In Middlesex County, election ballots are printed in English, Spanish, Gujarati, Hindi, and Punjabi. Middlesex County has the largest and fastest growing population of Chinese Americans of all counties in New Jersey, in places such as East Brunswick. Edison is also developing a sprawling suburban Chinatown, with other Chinese communities spread out over the county. There were 265,815 households out of which 34.20% had children under the age of 18 living with them, 57.00% were married couples living together, 10.80% had a female householder with no husband present, and 28.20% were non-families. 22.40% of all households were made up of individuals and 8.70% had someone living alone who was 65 years of age or older. The average household size was 2.74 and the average family size was 3.23. In the county, the population was spread out with 23.70% under the age of 18, 9.50% from 18 to 24, 32.80% from 25 to 44, 21.70% from 45 to 64, and 12.30% who were 65 years of age or older. The median age was 36 years. For every 100 females, there were 96.40 males. For every 100 females age 18 and over, there were 93.50 males. The median income for a household in the county was $61,446, and the median income for a family was $70,749. Males had a median income of $49,683 versus $35,054 for females. The per capita income for the county was $26,535. About 4.2% of families and 6.6% of the population were below the poverty line, including 7.2% of those under age 18 and 6.0% of those age 65 or over. 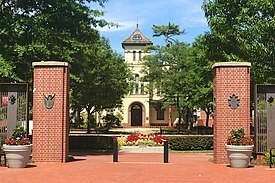 Middlesex County is governed by a Board of Chosen Freeholders, whose seven members are elected at-large on a partisan basis to serve three-year terms of office on a staggered basis, with either two or three seats coming up for election each year as part of the November general election. At an annual reorganization meeting held in January, the board selects from among its members a Freeholder Director and Deputy Director. The Freeholder Director appoints Freeholders to serve as Chairpersons and members on the various committees which oversee county departments. Middlesex County also elects three "constitutional officers" whose existence is laid out in the New Jersey Constitution. The County Clerk and Surrogate serve five-year terms and the Sheriff serves a three-year term of office. In 2016, freeholders were paid $23,438 and the freeholder director was paid an annual salary of $24,428, though Ronald Rios has accepted a salary of $8,340 as director. The Middlesex County Prosecutor is Andrew C. Carey of Monroe Township, who was nominated to fill the position in June 2014 by Governor of New Jersey Chris Christie. Middlesex County constitutes Vicinage 8 of the New Jersey Superior Court; the vicinage is seated at the Middlesex County Courthouse, at 56 Paterson Street in New Brunswick. The Middlesex Vicinage also has facilities for the Family Part at the Middlesex County Family Courthouse at 120 New Street, also in New Brunswick; there are also other facilities in New Brunswick and Perth Amboy for Probation. The Assignment Judge for Vicinage 8 is Alberto Rivas. The 6th and 12th Congressional Districts cover the county. For the 116th United States Congress, New Jersey's Sixth Congressional District is represented by Frank Pallone (D, Long Branch). For the 116th United States Congress, New Jersey's Twelfth Congressional District is represented by Bonnie Watson Coleman (D, Ewing Township). The county is part of the 12th, 14th, 16th, 17th, 18th, 19th and 22nd Districts in the New Jersey Legislature. For the 2018–2019 session (Senate, General Assembly), the 12th Legislative District of the New Jersey Legislature is represented in the State Senate by Samuel D. Thompson (R, Old Bridge Township) and in the General Assembly by Robert D. Clifton (R, Matawan) and Ronald S. Dancer (R, Plumsted Township). For the 2018–2019 session (Senate, General Assembly), the 14th Legislative District of the New Jersey Legislature is represented in the State Senate by Linda R. Greenstein (D, Plainsboro Township) and in the General Assembly by Daniel R. Benson (D, Hamilton Township, Mercer County) and Wayne DeAngelo (D, Hamilton Township, Mercer County). For the 2018–2019 session (Senate, General Assembly), the 16th Legislative District of the New Jersey Legislature is represented in the State Senate by Christopher Bateman (R, Branchburg) and in the General Assembly by Andrew Zwicker (D, South Brunswick) and Roy Freiman (D, Hillsborough Township). For the 2018–2019 session (Senate, General Assembly), the 17th Legislative District of the New Jersey Legislature is represented in the State Senate by Bob Smith (D, Piscataway) and in the General Assembly by Joseph Danielsen (D, Franklin Township, Somerset County) and Joseph V. Egan (D, New Brunswick). For the 2018–2019 session (Senate, General Assembly), the 18th Legislative District of the New Jersey Legislature is represented in the State Senate by Patrick J. Diegnan (D, South Plainfield) and in the General Assembly by Robert Karabinchak (D, Edison) and Nancy Pinkin (D, East Brunswick). For the 2018–2019 session (Senate, General Assembly), the 19th Legislative District of the New Jersey Legislature is represented in the State Senate by Joe Vitale (D, Woodbridge Township) and in the General Assembly by Craig Coughlin (D, Woodbridge Township) and Yvonne Lopez (D, Perth Amboy). For the 2018–2019 session (Senate, General Assembly), the 22nd Legislative District of the New Jersey Legislature is represented in the State Senate by Nicholas Scutari (D, Linden) and in the General Assembly by Linda Carter (politician) (D, Plainfield) and James J. Kennedy (D, Rahway). Carter was appointed in May 2018 to fill the vacant seat left following the death of Jerry Green the previous month after 26 years of service. As of March 23, 2011, there were a total of 455,044 registered voters in Middlesex County, of which 169,718 (37.3%) were registered as Democrats, 57,711 (12.7%) were registered as Republicans and 227,355 (50.0%) were registered as Unaffiliated. There were 260 voters registered to other parties. After being a Republican stronghold in the late 19th and early 20th centuries, Middlesex County leaned Democratic for much of the 20th century beginning with Franklin Roosevelt's victory in the county in 1932. Throughout the twentieth century, in close elections the county would always vote Democratic, sometimes by solid margins, but the county was willing to flip Republican in the midst of nationwide Republican landslides in the 1970s and 80s. However, since the 1990s, Middlesex County has become a Democratic stronghold at the national level, mirroring the state's heavy swing to the Democrats. Democrat Bill Clinton carried the county in 1992 and it has remained reliably blue in every election since. In the nationally close 2000 election, Democrat Al Gore won the county decisively with 59.9% of the vote to Republican George W. Bush's 36.1%, a Democratic victory margin of 23.7%, while winning the state overall by a 56-40 margin. In the 2004 U.S. Presidential election, many of the suburban counties surrounding New York City, including Middlesex County, swung Republican in response to the 9/11 terrorist attacks, but Democrat John Kerry still carried the county comfortably by a 13.6% margin over George W. Bush, Kerry taking 56.3% of the vote to Bush's 42.8%, while Kerry carried the state overall by 6.7% over Bush. In 2008, Barack Obama carried Middlesex County by a much larger 21.8% margin over John McCain, Obama taking 60.2% of the vote to McCain's 38.4%, while Obama won New Jersey overall by 15.5% over McCain. In 2012, Obama won an even more commanding victory in the county, receiving 63.2% of the vote to Republican Mitt Romney's 35.6%, a Democratic victory margin of 27.6%, while carrying New Jersey overall by 17.8%. Like much of the New York City metro area, Middlesex County was one of the few parts of the country to actually swing even harder in Obama's favor in 2012 compared to 2008, even as he lost ground nationally, indicating a long-term trend toward Democratic dominance in Middlesex County. In the 2005 Gubernatorial Election, the county went to Democrat Jon Corzine by a 56-39 margin; while in the 2009 Gubernatorial Election, Republican Chris Christie received 47% of the vote, defeating incumbent Democrat Corzine, who received around 45%. Thomas N. Acken served as the sheriff in 1891. Joseph Spicuzzo served in 2014 and was arrested for bribery. Mildred S. Scott is the current sheriff. Middlesex County hosts various county roads, state routes, US routes, and interstate highways, as well as toll highways. As of May 2010[update], the county had a total of 2,584.38 miles (4,159.16 km) of roadways, of which 2,118.08 miles (3,408.72 km) were maintained by the municipality, 292.16 miles (470.19 km) by Middlesex County and 131.48 miles (211.60 km) by the New Jersey Department of Transportation and 42.66 miles (68.65 km) by the New Jersey Turnpike Authority. County roads include County Route 501, County Route 514, County Route 516 (only in Old Bridge), County Route 520, County Route 522, County Route 527, County Route 529, County Route 531, County Route 535 and County Route 539. The state routes are: Route 18, Route 26 (only in North Brunswick Township – entirely concurrent with Livingston Avenue), Route 27, Route 28, Route 32, Route 33 (only in Monroe Township), Route 34 (only in Old Bridge), Route 35, Route 91 (concurrent with Jersey Avenue in North Brunswick Township and entering New Brunswick), Route 171, Route 172 (only in New Brunswick), Route 184 and Route 440. U.S. Routes include: U.S. Route 1, U.S. Route 9, U.S. Route 1/9 (only in Woodbridge Township) and U.S. Route 130. The county also includes some limited access highways and Interstates as well. Middlesex County hosts the southern end of the Middlesex Freeway (Interstate 287) which then turns into Route 440 that connects to the Outerbridge Crossing. The Garden State Parkway passes through the eastern edge of the county, which features nine interchanges and the northern start/end of the split-roadways (Express & Local Lanes). The New Jersey Turnpike carries Interstate 95 through the center of the county. The Turnpike has five interchanges in Middlesex County: Exit 12 in Carteret, Exit 11 in Woodbridge Township, Exit 10 in Edison, Exit 9 in East Brunswick and Exit 8A in Monroe Township. The NJDOT is upgrading the Route 18 "avenue" to a freeway between the Route 1 interchange all the way up to the new 18 Extension in Piscataway Township. The Turnpike Authority planned to build Route 92, which was to start near the intersection of Ridge Road & Route 1 in South Brunswick Township to Interchange 8A in Monroe Township. This plan was cancelled on December 1, 2006. The southern end of the "dual-dual" configuration (inner car lanes and outer truck lanes) used to be one mile south of Interchange 8A at the border of Cranbury Township and Monroe Township. It was relocated to Exit 6 in Mansfield Township in Burlington County after the Turnpike widening project was completed in early November 2014. NJ Transit provides Middlesex County with frequent commuter rail service along the North Jersey Coast Line, Northeast Corridor Line and Raritan Valley Line. The North Jersey Coast Line runs through the eastern part of the county. The Northeast Corridor Line runs through the northern and central part of the county. The Raritan Valley Line serves Dunellen and is accessible to other communities along the county's northern border with Union and Somerset counties. Intercity rail service is also provided by Amtrak. The routes that runs through Middlesex County are the Acela Express, Keystone, Northeast Regional, and Vermonter services, although only the Keystone and Northeast Regional have regular stops within Middlesex County, at either New Brunswick or Metropark stations. The Acela service also occasionally stops at Metropark. Bus service in Middlesex County is provided by New Jersey Transit, Coach USA's Suburban Transit, the extensive Rutgers Campus bus network, the MCAT shuttle system, and DASH buses. There are bus routes that serve all townships in the county, and studies are being conducted to create the New Brunswick Bus Rapid Transit system. The county offers more than 1,900 hospital beds among five major hospitals. Undisclosed: Canon, Japanese company specializing in imaging products. Municipalities in Middlesex County (with 2010 Census data for population, housing units and area in square miles) are: Other, unincorporated communities in the county are listed next to their parent municipality. Many of these areas are census-designated places that have been defined by the United States Census Bureau for enumeration purposes within a Township and for which 2010 population data is included in parentheses. Thompson Park in Monroe Township. In recent years, average temperatures in the county seat of New Brunswick have ranged from a low of 22 °F (−6 °C) in January to a high of 86 °F (30 °C) in July, although a record low of −13 °F (−25 °C) was recorded in January 1984 and a record high of 103 °F (39 °C) was recorded in July 1999. Average monthly precipitation ranged from 2.98 inches (76 mm) in February to 5.08 inches (129 mm) in July. ^ a b Middlesex County The Greatest County in the Land Archived 2016-10-28 at the Wayback Machine, County of Middlesex, New Jersey. Accessed October 27, 2016. ^ a b c d e f DP1 - Profile of General Population and Housing Characteristics: 2010 Demographic Profile Data for Middlesex County, New Jersey, United States Census Bureau. Accessed January 22, 2013. ^ a b c QuickFacts - Middlesex County, New Jersey; New Jersey; United States Archived 2018-04-02 at the Wayback Machine, United States Census Bureau. Accessed March 24, 2018. ^ , United States Census Bureau. Accessed March 24, 2018. ^ "Census 2000 Demographic Profiles". Archived from the original on July 15, 2011. Retrieved July 5, 2011. ^ History Archived 2016-10-17 at the Wayback Machine, Middlesex County, NJ. Accessed March 24, 2018. ^ a b Snyder, John P. The Story of New Jersey's Civil Boundaries: 1606-1968 Archived 2012-06-05 at the Wayback Machine, Bureau of Geology and Topography; Trenton, New Jersey; 1969. p. 161. Accessed October 1, 2013. ^ History of the Grand Jury Archived 2013-10-04 at the Wayback Machine, Middlesex County, New Jersey. Accessed October 1, 2013. "By June 19, 1683, the first County Court was held at Piscataway. It sat alternately in Piscataway and Woodbridge until 1688 when Perth Amboy was added as one of the three alternate sites. In 1778 New Brunswick became the most prime town in the county and at that time the Middlesex County Courts were transferred there." ^ "At a Glance - Middlesex County, the Greatest County in the Land!". Archived from the original on November 18, 2016. Retrieved December 3, 2016. ^ Census 2010 U.S. Gazetteer Files: New Jersey Counties Archived 2015-05-18 at the Wayback Machine, United States Census Bureau. Accessed May 10, 2015. ^ Kane, Joseph Nathan; and Aiken, Charles Curry. The American Counties: Origins of County Names, Dates of Creation, and Population Data, 1950-2000, p. 202. Scarecrow Press, 2005. ISBN 0810850362. Accessed January 22, 2013. ^ a b c d DP-1 - Profile of General Demographic Characteristics: 2000; Census 2000 Summary File 1 (SF 1) 100-Percent Data for Middlesex County, New Jersey, United States Census Bureau. Accessed January 22, 2013. ^ U.S. Census Bureau Delivers New Jersey's 2010 Census Population Totals Archived 2011-02-08 at the Wayback Machine, United States Census Bureau, February 3, 2011. Accessed February 5, 2011. ^ "ACS DEMOGRAPHIC AND HOUSING ESTIMATES 2011-2015 American Community Survey 5-Year Estimates". U.S. Census Bureau. Retrieved February 15, 2017. ^ Ensslin, John C.; and Sheingold, Dave. "Census: Asian Indians one of the fastest growing groups in North Jersey" Archived 2012-09-30 at the Wayback Machine, The Record (Bergen County), May 29, 2011. Accessed January 22, 2013. "Middlesex County has by far the largest Indian-American population, with about 104,705 people, followed by Hudson County, with 37,236, and Bergen County, with 24,973." ^ Haydon, Tom. "South Brunswick schools observe Hindu holiday, district becomes second in N.J. to close for Diwali" Archived 2012-02-10 at the Wayback Machine, The Star-Ledger, October 23, 2011. Accessed January 22, 2013. "The 2010 Census counted 104,705 residents of Indian descent in Middlesex County, ranking it third among U.S. counties for that population behind Queens, N.Y., and Santa Clara, Calif."
^ "State of New Jersey Department of State". State of New Jersey. Archived from the original on May 25, 2017. Retrieved May 29, 2017. ^ a b c Tables DP-1 to DP-4 from Census 2000 for Middlesex County, New Jersey Archived 2007-05-09 at the Wayback Machine, United States Census Bureau. Accessed October 1, 2013. ^ DP-2 - Profile of Selected Social Characteristics: 2000 from the Census 2000 Summary File 3 (SF 3) - Sample Data for Middlesex County, New Jersey, United States Census Bureau. Accessed September 30, 2013. ^ DP-3 - Profile of Selected Economic Characteristics: 2000 from Census 2000 Summary File 3 (SF 3) - Sample Data for Middlesex County, New Jersey, United States Census Bureau. Accessed September 30, 2013. ^ a b Board of Chosen Freeholders Archived 2017-10-22 at the Wayback Machine, Middlesex County, New Jersey. Accessed October 21, 2017. ^ History of the County Clerk's Office Archived 2013-08-26 at the Wayback Machine, Constitutional Officers Association of New Jersey. Accessed October 21, 2017. ^ History of the County Sheriff's Office Archived 2013-08-26 at the Wayback Machine, Constitutional Officers Association of New Jersey. Accessed October 21, 2017. ^ History of the Surrogate's Court Archived 2013-08-26 at the Wayback Machine, Constitutional Officers Association of New Jersey. Accessed October 21, 2017. ^ Gallo Jr., Bill. "Which N.J. county freeholders are paid the most?" Archived 2017-10-26 at the Wayback Machine, NJ.com, March 11, 2016. Accessed October 25, 2017. "Freeholder director: $24,438 (Current Freeholder Director Don Rios has opted to take a salary of only $8,340. ); Other freeholders: $23,438"
^ a b Elected County Officials Archived 2015-01-13 at the Wayback Machine, Middlesex County, New Jersey. Accessed October 21, 2017. ^ Ronald G. Rios Archived 2017-10-22 at the Wayback Machine, Middlesex County, New Jersey. Accessed October 21, 2017. ^ Charles E. Tomaro Archived 2017-10-22 at the Wayback Machine, Middlesex County, New Jersey. Accessed October 21, 2017. ^ Kenneth Armwood Archived 2017-10-22 at the Wayback Machine, Middlesex County, New Jersey. Accessed October 21, 2017. ^ Charles Kenny Archived 2017-10-21 at the Wayback Machine, Middlesex County, New Jersey. Accessed October 21, 2017. ^ Freeholder Leslie Koppel Archived 2017-10-22 at the Wayback Machine, Middlesex County, New Jersey. Accessed October 21, 2017. ^ Shanti Narra Archived 2016-12-20 at the Wayback Machine, Middlesex County, New Jersey. Accessed December 6, 2016. ^ Blanquita B. Valenti Archived 2017-10-22 at the Wayback Machine, Middlesex County, New Jersey. Accessed October 21, 2017. ^ County Clerk Elaine Flynn Archived 2017-10-21 at the Wayback Machine, Middlesex County, New Jersey. Accessed October 21, 2017. ^ Sheriff Mildred S. Scott Archived 2017-10-22 at the Wayback Machine, Middlesex County, New Jersey. Accessed October 21, 2017. ^ Surrogate Kevin J. Hoagland Archived 2017-10-22 at the Wayback Machine, Middlesex County, New Jersey. Accessed October 21, 2017. ^ The Prosecutor's Office Archived 2017-10-29 at the Wayback Machine, Middlesex County, New Jersey. Accessed October 28, 2017. ^ "Governor Chris Christie Files Nominations" Archived 2016-06-21 at the Wayback Machine, Governor of New Jersey Chris Christie, press release dated June 3, 2014. Accessed October 26, 2017. "Prosecutorial Nominations - Nominate for appointment Andrew C. Carey (Monroe Township, Middlesex)"
^ a b c Middlesex Vicinage Archived 2017-10-10 at the Wayback Machine, New Jersey Courts. Accessed October 21, 2017. ^ District 14 Legislators, New Jersey Legislature. Accessed January 22, 2018. ^ Voter Registration Summary - Middlesex Archived 2013-10-04 at the Wayback Machine, New Jersey Department of State Division of Elections, March 23, 2011. Accessed January 11, 2015. ^ "New Jersey Division of Elections Official General Election Results" (PDF). Archived (PDF) from the original on 9 May 2013. Retrieved 4 February 2014. ^ "How A Crooked Former Sheriff Persuaded The State To Let Him Out Of Prison". NJ.com. February 1, 2016. Archived from the original on February 4, 2018. Retrieved 2018-02-03. ^ Middlesex County Mileage by Municipality and Jurisdiction Archived 2015-02-10 at the Wayback Machine, New Jersey Department of Transportation, May 2010. Accessed July 24, 2014. ^ Travel Map Archived 2017-10-25 at the Wayback Machine, New Jersey Turnpike Authority. Accessed October 24, 2017. ^ NJDOT breaks ground on project to completeRoute 18 extension to Interstate 287 in Piscataway; Project is designed to improve mobility and promote economic development in central New Jersey Archived 2012-04-02 at the Wayback Machine, New Jersey Department of Transportation press release, dated February 15, 2012. Accessed October 6, 2013. ^ Gov. Christie, NJDOT Commissioner FoxPraise $2.3 Billion NJ Turnpike Infrastructure Investment Project Archived 2014-11-03 at the Wayback Machine, New Jersey Turnpike Authority. Accessed November 3, 2014. ^ North Jersey Coast Line Archived 2013-07-23 at the Wayback Machine, NJ Transit. Accessed August 24, 2014. ^ Northeast Corridor Line Archived 2014-07-12 at the Wayback Machine, NJ Transit. Accessed August 24, 2014. ^ Raritan Valley Line Archived 2013-10-15 at the Wayback Machine, NJ Transit. Accessed August 24, 2014. ^ Campus Buses/Shuttle Service Archived 2012-04-02 at the Wayback Machine, Rutgers University. Accessed October 9, 2016. ^ Middlesex County Area Transit (MCAT) Shuttle Routes Archived 2015-01-09 at the Wayback Machine, Middlesex County. Accessed October 9, 2016. ^ DASH Bus Routes Archived 2013-06-15 at the Wayback Machine, Ridewise. Accessed October 9, 2016. ^ Locations Archived 2015-09-05 at the Wayback Machine, Middlesex County College. Accessed September 17, 2015. ^ One Community, Five Campuses Archived 2015-09-06 at the Wayback Machine, Rutgers University–New Brunswick. Accessed September 17, 2015. ^ Locations and Directions Archived 2015-09-07 at the Wayback Machine, Rutgers Biomedical and Health Sciences. Accessed September 17, 2015. ^ Forrestal Campus Archived 2008-07-05 at the Wayback Machine, Princeton University. Accessed July 23, 2008. ^ North Brunswick Campus Archived 2015-09-05 at the Wayback Machine, DeVry University. Accessed September 17, 2015. ^ Health Care Archived 2015-09-18 at the Wayback Machine, Middlesex County, New Jersey. Accessed September 17, 2015. ^ Healthcare in Middlesex County, New Jersey Archived 2017-10-22 at the Wayback Machine, Middlesex County, NJ Convention & Visitors Bureau. Accessed September 17, 2015. ^ About JFK Medical Center Archived 2015-09-06 at the Wayback Machine, JFK Medical Center. Accessed September 17, 2015. "Founded in 1967, JFK Medical Center is a non-profit, 498-bed community hospital, serving residents of Middlesex, Union and Somerset counties in Central New Jersey." ^ PSE&G New Brunswick Archived 2015-09-05 at the Wayback Machine, Children's Specialized Hospital. Accessed September 17, 2015. ^ a b Fact Sheet Archived 2015-09-05 at the Wayback Machine Raritan Bay Medical Center. Accessed September 17, 2015. "Licensed for 501 beds with a medical staff of more than 600, RBMC provides medical-surgical, maternity, pediatric, diagnostic imaging, laboratory and general and critical care, as well as adult behavioral health, emergency and interventional cardiac and same day surgery services... 388 licensed beds at Perth Amboy location; 113 licensed beds at Old Bridge location"
^ About Archived 2015-09-05 at the Wayback Machine, Robert Wood Johnson University Hospital. Accessed September 17, 2015. ^ Home Page Archived 2011-01-10 at the Wayback Machine, St. Peter's University Hospital. Accessed September 17, 2015. "From our simple beginnings in 1907, Saint Peter's has grown to become a technologically advanced, 478-bed teaching hospital that provides a broad array of services to the community. 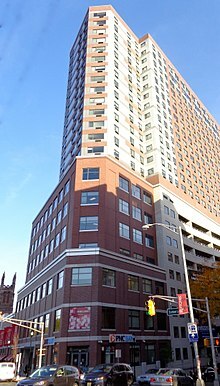 Saint Peter's University Hospital, a member of the Saint Peter's Healthcare System, is a non-profit, acute care facility sponsored by the Roman Catholic Diocese of Metuchen, NJ." ^ PHCS Facts Archived 2015-09-21 at the Wayback Machine, University Medical Center of Princeton at Plainsboro. Accessed September 17, 2015. ^ MAJOR EMPLOYERS LOCATED IN MIDDLESEX COUNTY, NEW JERSEY Archived 2010-12-27 at the Wayback Machine, Middlesex County Department of Economic Development, March 2006. Accessed July 5, 2007. ^ GCT-PH1: Population, Housing Units, Area, and Density: 2010 - County -- County Subdivision and Place from the 2010 Census Summary File 1 for Middlesex County, New Jersey, United States Census Bureau. Accessed January 19, 2014. ^ a b Monthly Averages for New Brunswick, New Jersey Archived 2013-07-08 at the Wayback Machine, The Weather Channel. Accessed October 13, 2012. Wikimedia Commons has media related to Middlesex County, New Jersey. Middlesex County official website Retrieved July 1, 2008. "Middlesex: III. A central county of New Jersey" . The American Cyclopædia. 1879.